Pepe Coronado, Intrepido, USA in the clear! 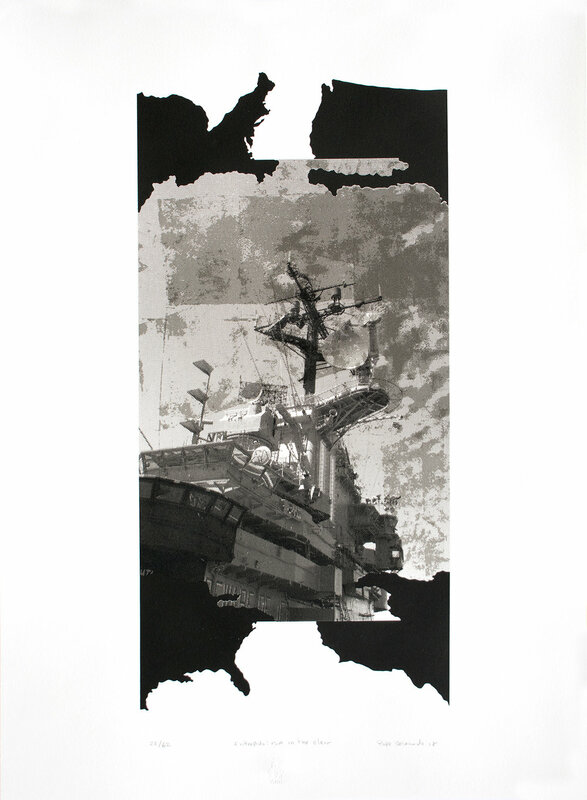 Artist and printmaker Pepe Coronado, incorporated a fragmented map of the Island of the Dominican republic-Haiti and the USA with a photograph of the USS Intrepid in its present moment with symbolic gray tones to recall a historic moment. Today the USS Intrepid sits in all its glory, newly refurbished, a museum anchored on the Hudson that thrills young and old with a privileged view of the innards of a once-powerful aircraft carrier. But for Pepe Coronado, who was born precisely in the year of the invasion, the US Intrepid is a reminder of a pivotal moment in Dominican history, an election usurped, a constitution subverted. Pepe Coronado was born and raised in the Dominican Republic and currently resides in New York City. Coronado is a founding member of the print collective Dominican York Proyecto GRAFICA, founder of Coronado Print Studio, and was a resident teaching artist at the Hudson River Museum in New York. He has taught printmaking at the Corcoran College of Art; Georgetown University; and at the Maryland Institute College of Art in Baltimore, where he earned the Master of Fine Arts. Coronado was a master printer for Pyramid Atlantic in Silver Spring, Maryland; the Hand Print Workshop International in Alexandria, Virginia; and the Serie Print Project in Austin, Texas. Coronado’s most recent solo exhibitions include Interactions: Borders, Boundaries and Historical Relations of the US/DR, Prizm Art Fair, Rush Philanthropic Arts Foundation, Miami. ; Boundaries, Curated by Margaret Moulton, The Hastings Village Arts Commission Gallery, Hastings on Hudson, NY; Projects Photo / Prints, Gallery 410 GooDBudY, Washington, DC; Construcciones - Obstrucciones 2005 - 10, Casa de Teatro Santo Domingo DR for the PhotoImagen Biennial, curated by Sara Hermann, and at the Center for the Digital Arts, Westchester Community College, NY, curated by Lise Prown; Obstrucciones, Gallery 101, Georgetown University, Washington DC and Amos Eno Gallery, Brooklyn, NY.